Protecting your home or business from unwanted water is an increasing concern for Ontario residents. One way to protect your property is to install a backflow preventer. A backflow preventer is a device used to prevent potable water supplies and the unwanted reversal of water flow into your plumbing system. It ensures the drinking water in your home or business is protected from pollutants, contaminants, infectious agents and other substances from getting into your water supply. There is a potential for backflow water to get into your home when there is a high demand on the water system, a water main bursts, or there is a reduction of pressure in the water lines. During these situations, contaminated water could enter your water system. 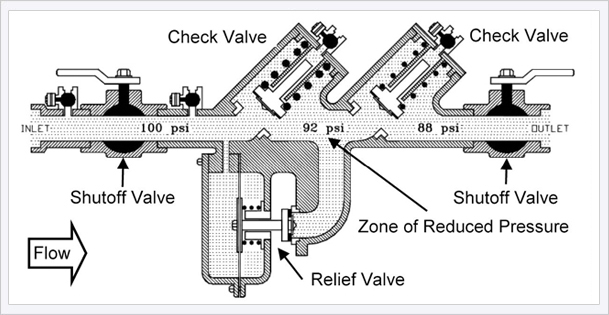 A backflow preventer works by automatically sensing a reverse flow of water in a pipe. When this occurs, the device completely closes the line, ensuring no undesirable water gets into your water system. Backflow preventers are commonly installed at the water connection from city lines to your property. It can also be installed at or near your water meter and it other areas where a potable water system connects with a non-potable water system. Examples of these cross connections that are found in homes include washers, dishwashers and fire sprinkler systems. How to Install a Backflow Preventer? Before installing anything on your property, it’s important to check to the building codes in your city to make sure you comply with all regulations. It’s also important to check and see if you require a permit to complete the work. The next step is to locate the pipe or area where it will be installed. In most cases this will be located by your water main, which is located in the front of your home, usually near the curb. You’ll then be required to dig down, expose the connection, and then select the type of backflow preventer you want to use. Sound like a lot of work? It is, and its work that should be completed by a licensed professional with experience working with backflow preventers. It’s important to hire a qualified backflow preventer contractor or plumber to ensure it is installed correctly and according to the building code in your city. When hiring a plumber it’s important to ensure they have the proper certification to install a backflow preventer on your property. In Toronto, plumbers and technicians must possess an Ontario Water Works Association (OWWA) or equivalent certification as a Cross Connection Control/Backflow Prevention Specialist in addition to a master plumber or journeyman plumber with a contractor licence. Another thing to look for is experience and reliability. Look for a plumber that has a good reputation in the area, is known for providing top quality service, and someone who does good work. If you are looking for someone to install a backflow preventer in your home or business, or if you have questions about the presence of, or need for, a backflow preventer device on your property, contact Bradshaw Plumbing today.